the hummingbirds have arrived, and it's time to get the feeders out. 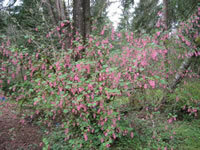 The Red Flowering Currant is a wildflower that is native to most of the west coast of the United States and Canada. In early spring it produces pendulous clusters of red or pink flowers that attract and feed hummingbirds, bees and butterflies. The small bluish-black berries are edible, but they taste terrible. However, they are eaten by a wide variety of wild birds. Flowering Currants can be grown in full sun, but they prefer partial shade. with a pH somewhere between 5.5-6.5. To ensure the fullest flower and fruit production, Flowering Currants should be planted in groups or in close proximity to other Currant plants. 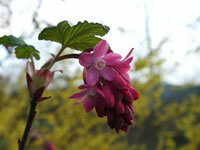 Ribes sanguineum plants can be grown from seed that should be sown directly into the garden or coldframe in the fall. If you are collecting seeds from your Flowering Currant, be sure to clean the pulp from the seeds thoroughly before storing them. Flowering Currants can also be propagated from cuttings struck in early summer. Another method of propagation is by tip or ground layering. This is done by pinning the tip of a branch to the ground where it will root.